Great project, hope it all goes well..
Go over to performance boats site and search for obnoxious001. Barry use to work for Banks back in the day and will get you all set up. Thank you, I've already posted over there and i have people helping me there too. Thanks for your help. So if i wanted to post pictures of my progress for you guys to see, how would i do this. It is not letting me post pictures or links since i am new here. Hope this pic comes through & helps (found it on the internet). Forgot to mention if you do have the original turbos from the 475 package the turbo housings have an approx. 3/4" hole in them to bleed off some of the exhaust. This was how Mercruiser regulated the boost. I welded mine shut & put wastegates on. Do you by any chance have pictures of the wastegate setup you put on? I may be able to dig a better pic out but you can see under the tailpipe I took the wedge spacer between the log manifold and the turbo and modified it by welding the tube and flange out the back. The flange matches the wastegate flange which bolts to it. For the extra exhaust I welded tubing and plumbed it to the inner transom plate exhaust cavities. I see it now, this means the spacer is not water cooled right? 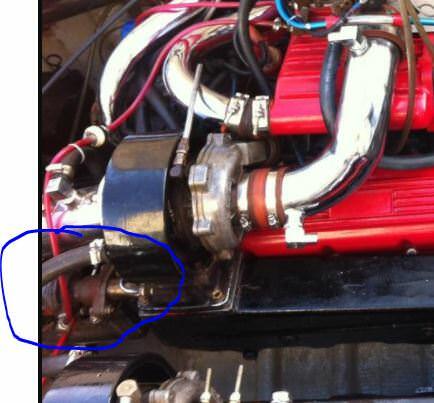 The wedge spacer (mercruiser/Gale Banks item) is water jacketed but, correct, my wastegate in/out was not water cooled.